The natural lens of the eye plays an important part in vision. It bends light rays that enter the eye and is responsible for clarity of sight. Cataract patients have a colored, blurred or cloudy lens which prevents them from having clear vision. During cataract operations, the lens is always removed and replaced with an artificial lens. The artificial lens or intraocular lens (IOL) comes in different forms depending on the type of correction that is needed or wanted by each patient. The lens power is determined for each patient before they have their surgery. Monofocal lens is the most preferred choice by patients because it requires little to no adjustment and is also covered by insurance. The standard monofocal lens improves vision for a set distance but patients still need to wear glasses for better vision. Patients who have suffered from astigmatism or those that still have it will find it difficult to read or view things at an intermediate distance. Almost all patients with standard monofocal IOL's will need bifocals. Patients who suffer from presbyopia can choose multifocal lens as their preferred choice. The best part about these lenses is that they do not require any muscular activity and focusing is much better than monofocal lens. The lenses provide excellent all-around vision and reading or viewing objects without glasses is easy. 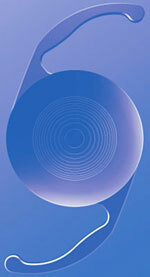 The Toric lens is yet another type of lens that is used to restore focus after a cataract surgery. It is used to treat pre-existing astigmatism, to provide great distance vision without glasses. The lens helps patients see for a limited distance but most require over-the-counter reading glasses for viewing close objects. Accommodating lenses such as the Crystalens are more premium and offer better vision range than conventional or monofocal lens. Usually, conventional lenses require the use of glasses to support the vision. The Crystalens is designed to flex inside the eye to function in a similar manner to the normal lens of the eye. Accommodating lenses are more expensive owing to their versatile use and because they are not covered by insurance. The goal for surgery is to provide 90% freedom from glasses once this implant is fully functional. Gone are the days when permanent dependance on glasse full time was the only option for cataract patients. Patients can choose from a wide variety of lenses that provides better vision. Some lens still requires the use of glasses whereas some don’t require any glass at all. The choice of lens depends on cost and the goals for freedom from glasses that the patient desires. The use of special lenses for cataract surgery has become immensely popular and it will continue to be so in the future.